Good news for people who don't like their money: The only known photograph taken of the iceberg that sank the Titanic is going up for auction — and it's expected to fetch over $10,000. Copyright. Blueberg taken by Captain W. F. Wood S. S. Etonian on 12/4/12 in Lat 41° 50 N Long 49° 50 W. Titanic struck 14/4/12 and sank in three hours. According to PetaPixel, there are a number of reasons that have led experts to believe that the photo is legit. First, it was captured at a location 2-3 days (in iceberg floating time) from where the ship sank. 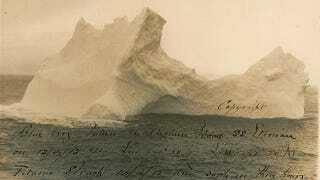 Second, the shape of the iceberg matches the sketches offered by eyewitnesses who survived the disaster, including the lookout who first spotted the ice in the horizon. Finally, the iceberg's shape resembles another photo (seen in the 1976 book A Night to Remember) taken from a ship named Prinz Adalbert, which was present in the area during the day after the sinking. RR Auction notes that the difference in appearance between the two icebergs may be "attributable to the angle of the photographer and the aftermath of impact," and that all these reasons taken together have allowed "noted Titanic experts to establish this photograph as capturing the iceberg everyone has been talking about for the past century." The auction ends on December 16, 2012, so you still have time to add this to your collection. Also be sure to check out the unseen photos from the sinking of the Titanic that only emerged recently.